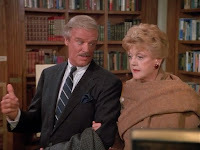 Murder, She Wrote and The Father Dowling Mysteries supposedly fall into the category of "cozy" mysteries. They involve private detectives--in fact, private detectives who don't think of themselves as detectives--who use their commonsense to investigate crimes among a limited number of suspects. Yet both shows include a large number of episodes where the narrative conflict revolves around organized crime or spies. I find both of these subjects dull. When watching Murder, She Wrote, I always prefer Keith Michell episodes to Len Cariou episodes, not because I don't like Len Cariou, but because I prefer crimes about insurance fraud to crimes about international secrets. I've been trying to figure out why there is so much reliance on mafia dons and spies in these extremely cozy shows. 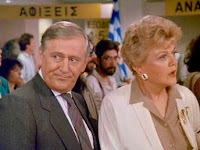 Murder Diagnosis relies on them far less--as did the early seasons of NCIS (bizarrely enough) and even The Closer. I've decided that it comes down to the writing. If you're a writer and you have to produce fifty to sixty minutes of alibis and red herrings and suspects and you have to keep characters active/moving around--it is so much easier to do this with mobs and spies than with locked room mysteries involving a house of exactly six suspects, all related to the victim. Murder, Diagnosis, like NCIS and The Closer, has built-in movement. The doctor can save a life. Or send his subordinates out of the hospital to interview a witness. NCIS has Gibbs throwing away cell phones and Ziva driving the van really fast. And The Closer has an entire LAPD to keep the characters moving around. And an excuse to wear hazmat suits. But a priest has no reason to move around other than in his parish--and only so many people can die in his church before he becomes an Angel of Death and nobody comes to church. Angela Lansbury as Jessica Fletcher has more reason to leave Cabot Cove--she has book deals to sign and publishers to meet--but being the practical woman she is, little reason to go chasing after a murderer unless circumstances compel her. Yup, there's a reason so many shows use the FBI as the detectives--it supplies built-in reasons to get people to not sit at home on their computers and do all their research from there. As Bones proves, the FBI as detective doesn't preclude domestic murders. In fact, domestic murders are so much easier to investigate with the FBI--writing-wise.